The front portico of the "Sipping Streams Tea House" in Fairbanks, AK. Photo by Jeremia Schrock. 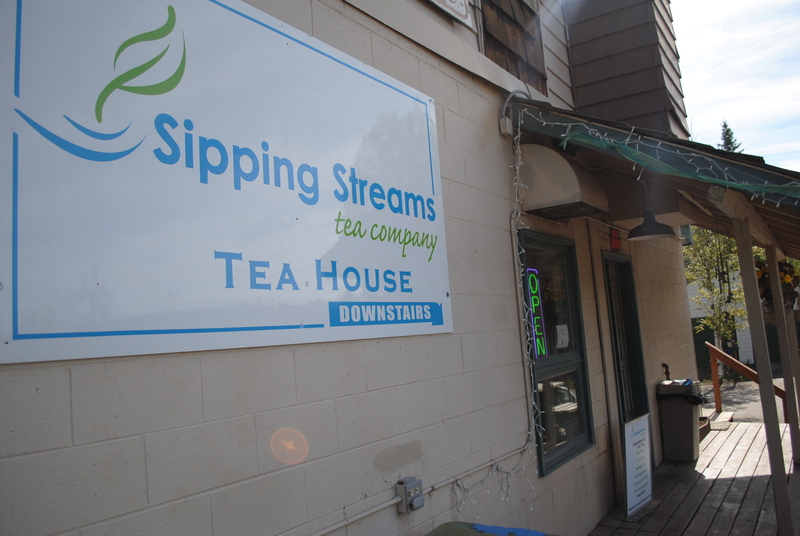 Over the next week, the Sipping Streams Tea Company will host two unique tea-related workshops at it’s College Road location. This Friday, a tea basics class will be held which will highlight preparation methods for different teas, the medicinal properties of various mixes, and a history of tea itself. The five basic teas (white, green, oolong, black and pu-er) will also be discussed and drunk by workshop goers. Next Tuesday, a workshop on kombucha (a drink made from fermented tea and sugar) instruction will also be held. Jenny Downer-Tse, the owner and resident tea expert of Sipping Streams, has made tea something of her life’s work. However, things were not always as such. Not long after switching to tea (and moving back to Alaska), Jenny began making and selling her own mixes; first at the Farmers Market and later at Pioneer Park. In fact, a recent concoction of hers, Boreal Solace, was a finalist in the 2010 North American Tea Championships. Her first entry (an herbal blend of fireweed and low bush cranberry’s) into such a competition, Jenny spent hours working her mix and researching the championship judges preferences and tastes. She would stay up late at night, sorting through every tea leaf by hand in order to ensure total uniformity in taste and texture. For Jenny, tea is fun, but also a serious business. 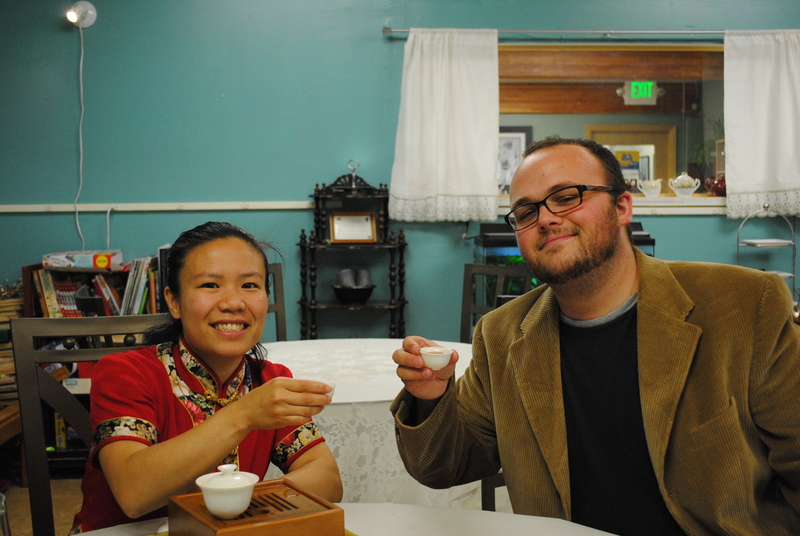 Jenny Downer-Tse and the blogger enjoy a cup of tea in the main room of the "Sipping Streams Tea House." Photo by Jeremia Schrock. Both workshops are aimed at “people who are into different cultures and continually learning,” she said, adding that such people are generally interested in tea and already customers of hers. These workshops will be the first of many this fall, including several advanced tea preparation and enjoyment classes. Jenny, a Speciality Tea Institute certified tea expert, has also taken her tea classes to campus, having taught such classes through the UAF Community and Technical College (formally the Tanana Valley Campus). The answer, according to Jenny, is that “every customer should be able to choose the best quality product for themselves.” For her, the more experience a customer has the better they are at identifying “counterfeit” teas from real teas. “Even if you went to Chinatown and didn’t speak Chinese you could at least order a tea!” she said. Also on the tea houses agenda is an upcoming radio show on 96.9 KYSC. It is set to air next Tuesday (August 24) at 7AM and will run for 10 weeks. The 2-5 minute showette will feature Jenny discussing the histories, myths and legends of tea, as well as sampling different blends with the stations DJ. Friday’s workshop will be from 6-7 PM this Friday (August 20), while the Kombucha class will be at the same time this coming Tuesday (August 24). The cost for the tea basics workshop is $20/person while the Kombucha class is $25. Space is limited for both as only 12-15 people will be accepted. The events will be held at the tea shop, which is located at 3535 College Rd. Lower Suite B. For workshop information, contact Jenny at (907) – 457 -1660.